Lots of people bash them, but at the same time, lots of people are buying them. And as with SUVs, much of the bashing is justified. 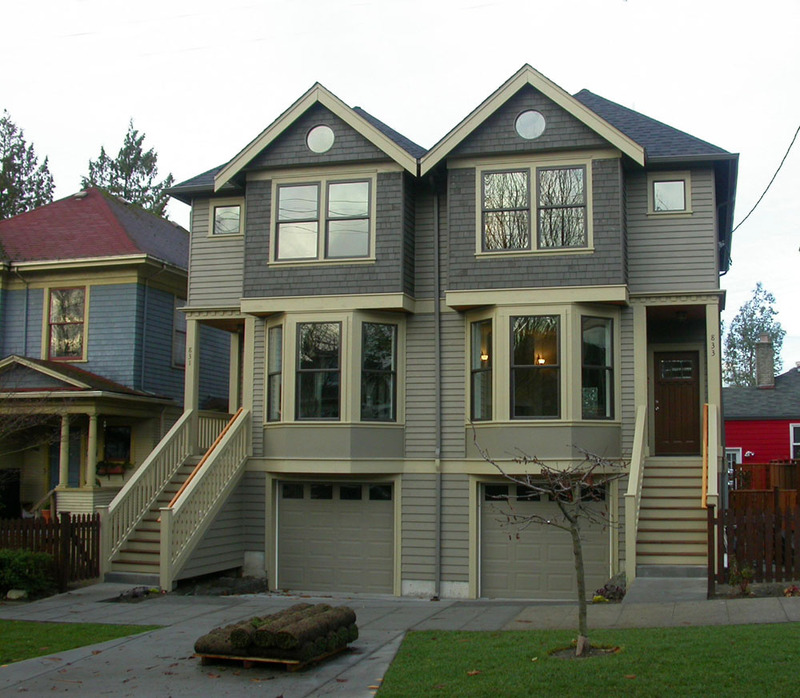 But some help could be on the way: the scourge of the townhouses is on the radar of Seattle city planners who are updating multifamily zoning code. But looky, the ones shown above aren’t too bad, maybe even kind of nice, dare I say. The biggest design compromise is a result of accommodating cars: the first floor is too high off the ground, and the garage doors and driveway present a big deadspace to the street. Current price tag is $570,000, though they may not get that much — townhouses are getting hit hard in the recent turndown. These townhouses, along with the new single-family house next to them (not shown), replaced a modest post-war box duplex, like the red one in the right background of the photo. They were cheap to rent, in pretty good shape, had a big yard, and no garages (I know cause some years ago I had a girlfriend who lived there). So housing unit density was increased by 50%, while affordability was reduced by, let’s say, a buttload, give or take. So it goes. Posted by dan bertolet on	Saturday, December 8th, 2007 at 12:08 am. You can follow any responses to this entry through the RSS 2.0 feed. You can leave a response, or trackback from your own site. I have a foto of this very townhome in a file at work that I’m using for my big long-range project [19+ MB] The light doesn’t look right in InDesign so I’m not using it, but I found it compelling enough to use as an example of decent compact development. My monitor doesn’t show a text color change for embedded HTML links, Dan’l. But I like that I can use title for mouseovers. A property solicitor will act with your best interests at heart throughout the entire transaction regardless of whether you are selling or buying. Property solicitors will deal with almost all aspects of the transaction and if anything is required from you then they would advice you accordingly and this means that your transaction can run smoothly. However, if you do not choose a reliable and experiences property lawyer then you may come unstuck later on in the transaction. For example, some property solicitors mat not communicate enough with their clients and poor communication can lead to confusion and unwanted stress.